This is the grand prize winner from this year's annual oyster cook-off! Preheat oven to 450 degrees. F.
Rinse oysters under cold running water. Put oysters in a pot of boiling water and blanch for 7-8 seconds. Drain oysters in a colander. Then place on paper towel-liked plate to drain. In a bowl, mix together miso, mayonnaise and mirin. Remove stem of each shiitake mushroom. Discard stems. Slice mushrooms thinly. Spread butter lighly inside of 12 shells and lay on a rimmed baking sheet, open side up. Divide shiitake mushrooms among the shells. 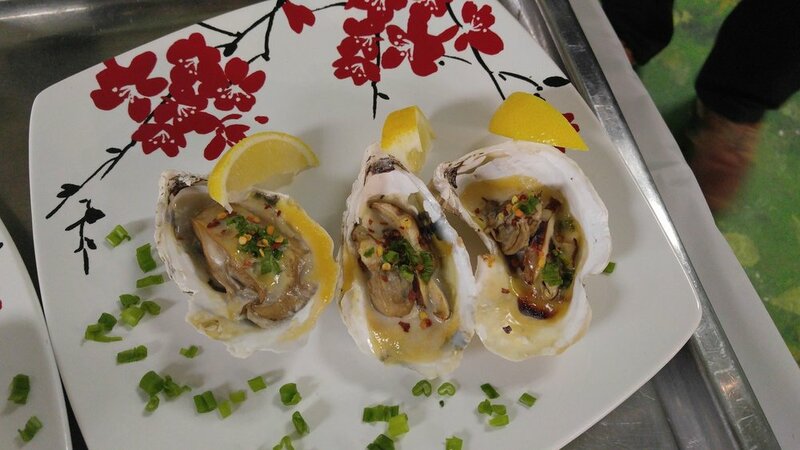 Put 1 oysters in each shell on top of mushrooms. Spread miso mixture over each oyster and sprinkle with scallion on top. Bake for 10-12 minutes or until the top is nicely browned. To serve, sprinkle with crushed red pepper over the top.